Atelier’s architect, Alistair Downie, infused tranquility and serenity into every modern detail at this two-story villa. From the master bedroom balcony’s ocean views to the gourmet kitchen, there’s sleek design throughout the whole property. Complete with a garden that measures half an acre, this holiday rental is the ideal way to vacation. 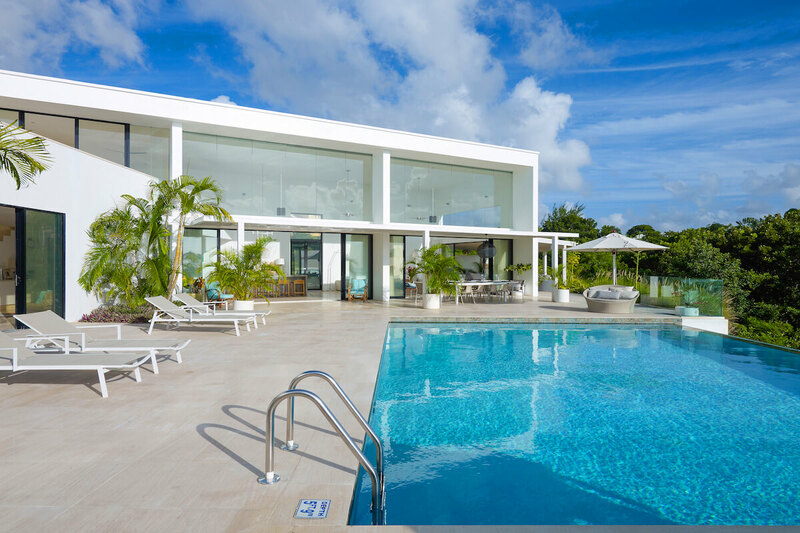 Atelier Villa sits on a ridge above Barbados’ west coast and overlooks dramatic ocean views. This gated, garden home is staffed with a housekeeper and a chef, who will prepare three meals a day six days a week. The villa is surrounded by a half-acre of gardens with ocean views. There’s a rooftop terrace with ocean views and tons of space. On the ground level, the 32 x 27 ft. infinity pool sits amidst a tiled deck with loungers and umbrellas. There’s an al fresco dining table as well, and floor-to-ceiling glass leads into the common area. The ultra-modern kitchen has white granite counters and stainless steel appliances, and the adjacent lounge has plush furnishings. Atelier features laundry facilities, and a laundress for bookings with over 6 guests. Atelier Villa has four spacious bedrooms. Upstairs, the master suite has a king bed, a balcony, and a covered terrace. Its ensuite bathroom has both a tub and a shower. Three guest suites are located on the ground floor: two have king beds and one has a queen bed. One suite’s bathroom has an enclosed outdoor shower and opens to the pool deck, while the other two suites share a bathroom. There’s several golf courses within minutes of Atelier, such as the Royal Westmoreland and Sandy Lane. The west coast is home to Barbados’ most beautiful beaches, and action-packed Speightstown is minutes away. pool size 32 ft. x 27 ft.